Sportsbet is Australia’s biggest online betting company, but which bookmakers look after their punters and have the highest number of happy customers? Sportsbet free bet offers explained. Sportsbet.com.au is Australia's biggest online bookmaker. Part of the Paddy Power Group, they are a government regulated Australian company with headquarters in Melbourne. Go to Sportsbet to see what special offers they have for you. Horse Racing: Best odds of the three TAB's or the SP plus Fixed Odds or Top Fluc betting. Home Tote divs for Quinella, Exacta, Trifecta, Supertab divs for First Four. Quaddies, Doubles & Trebles available. 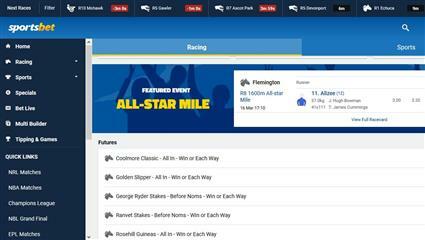 Flexi Betting on all multiple bets including Quinella, Exacta, Trifecta, First Four, Doubles & Quaddies. Free Black Book service - get an SMS or Email every time your favourite horses or greyhounds race. Get the early mail from Sportsbet's own form analysts on this weekend's featured horse racing. Join Sportsbet.com.au here for an exclusive offer ~ bring your friends here and get a free $100 bet! Open your account here and bet anywhere, any time (even at the track) with Sportsbet Mobile. Conditions apply, see website for more info. 4. Verify your ID to cash out.